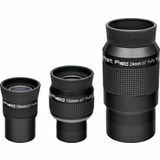 Swap out your Plossls for our EF Widefields and enjoy exceptionally flat images. Expansive fields of view provide a comfortable, immersive experience. 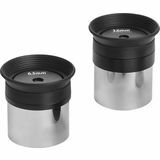 All are fully multi-coated with rubber grip and twist-up eyecups. 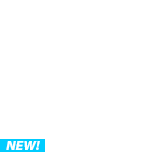 Affordable too! 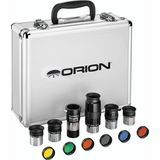 Combining a wide field of view with tack sharp images at the edges of the field, the Orion Ultra Flat Field eyepieces will quickly become a favorite in your telescope accessory case! 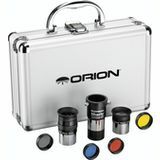 The Orion Edge-On Planetary Eyepieces provide medium to high power views of moon and planetary details. 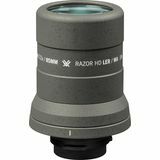 The multi-element design provides a flat field of view ensuring an extremely sharp focus. Long eye relief makes viewing comfortable for everyone. 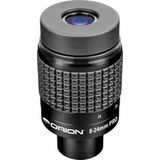 The Orion Expanse eyepieces offer a wide 66-degree field of view and superior optical performance at a very affordable price. Great eye relief on all models ensures eyeglass wearers can view the entire field. 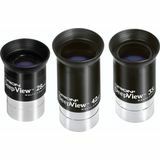 These Explore Scientific 92-degree series telescope eyepieces have the longest eye-relief in their class, which is perfect for those who desire the most comfortable hyper-wide viewing experience. 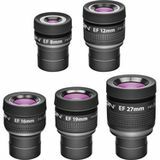 Available in 12mm and 17mm focal lengths. 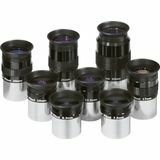 The Explore Scientific 100-degree Series eyepieces are hyper-wide class oculars that can transform your visual astronomy experience. 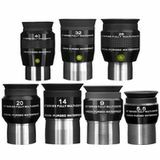 Explore Scientific 100-Degree Eyepieces are available in 5.5mm, 9mm, 14mm, 20mm, 25mm, and 30mm focal lengths. 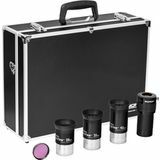 Orion E-Series Beginner Telescope Eyepieces provide beginning astronomers with an affordable eyepiece selection to get the most out of a new telescope. 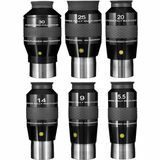 Available in 3.6mm and 6.3mm focal lengths. 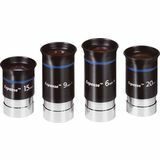 These 68-degree wide field eyepieces from Explore Scientific are optimized to produce high contrast, high resolution, and superior flat field characteristics. 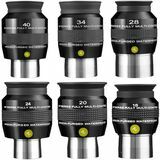 Available in 16mm, 20mm, 24mm, 28mm, 34mm, and 40mm focal lengths. 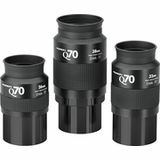 The Explore Scientific 62-degree Series eyepieces are excellent flat-field multi-element oculars that can transform your visual astronomy experience. 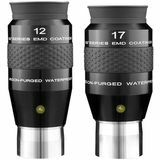 With their 82-degree apparent field of view, these Explore Scientific eyepieces will immerse you in a very comfortable ultra-wide field. 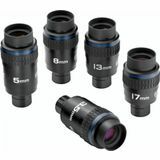 Available in 4.7mm, 6.7mm, 8.8mm, 11mm, 14mm, 18mm, 24mm, and 30mm focal lengths. 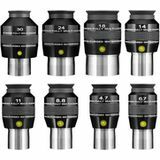 Telescope eyepieces focus the light from a telescope into the final image and determine (along with the telescope's optics) the magnification of the image. 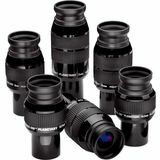 From the basic four-lens Plossl design to wide-angle, exotic designs that incorporate more lenses, Orion telescope eyepieces deliver reliable image quality and value. 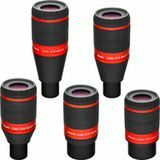 Be sure to get a few different focal lengths to ensure a range of magnification options for different observing targets.